Saturday July 20th proved to be a hot day off the court and an even hotter one on court at the Ardencote Manor Club, Warwickshire for the annual Heart of England Racketball Championship. Temperatures were soaring so the ball just kept on bouncing and that paved the way for some real brutal matches. 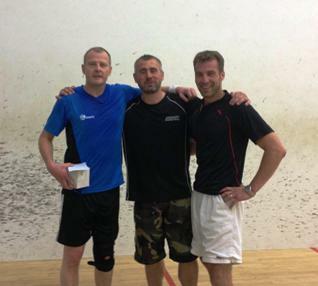 For the first time at this event there were two categories Open age and Mens Over 40 and both were keenly contested. In the Open event the longest set of the day was recorded by Peter Staunton and Jason Pike, Staunton edging it 12-10 but it was Pike that had the legs and came through 2-1 in the end. Staunton was then effectively eliminated from any chance of winning when last years Champion Guy Pearson stepped on court and dispatched Staunton 2-0. After a short break Pearson and Pike went on court in the deciding fixture, both men on form with Pike one of the runners up from the recent UK-Racketball Leamington event and Pearson having recently taken the Dunlop Nationals Champion Jamie Haycocks to 5 sets. The early stages were close but it was Pearson who dominated and took the first. Pike ran into a 9-5 lead in the 2nd but couldn’t hold on and Pearson hauled him back to take it on the tie-break 2-0 and retain his Heart of England Crown. The Over 40 event was a full 12 person draw. The early group stages were fast and furious and saw some great competitive Racketball. The standard was high and the games were close with Phil Perchard and Ian Furlonger surely feeling unlucky not to make it through to the semis. Eventually the group winners probably went with the form book to set up two punishing semi-finals that both went to the final deciding set. In the first of these Andy Murray; currently UK number 5 and rising took on local favourite Paul Chadwick. Chadwick made the early running stunning Murray by taking the 1st set forcing Murray to dig deep to grind it out to eventually pull through, 2-1. The second semi final was an all Ardencote affair with Matt Pugh and Jon Summers going head to head as they have done on so many other times before but it was Summers that kept his Heart of England jinx over Pugh and just edged it at the end of the gruelling marathon, 2-1. So it was Murray verses the un-ranked Summers in the final but the question on everyone’s mind was who would have enough energy left in this heat!? Murray dug deep and started finding his range and hitting perfect length after length, Summers’ retrieval excellent but in the end the consistency was too much and Murray won through to take the Over 40’s title 2-0. This was certainly a fitting climax to a great day of Racketball and a fantastic advert for the game. This competition is looking to expand again next year and include other categories. Ladies and an over 50 event are all possibilities. Please look out for the entry forms next year on UK-Racketball and get your application in early for this social and enjoyable day of Racketball at Ardencote Manor. Report written by Matt Pugh and edited by Vicky Clark at UK-Racketball. 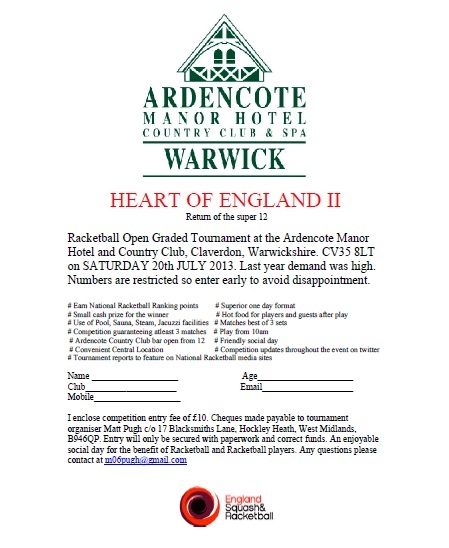 The Heart of England II Racketball Open returns this year to the Ardencote Manor Hotel in Warwick. It is a one-day event due to take place on Saturday 20th July 2013 from 10am and is a graded tournament. The Heart of England II is also an England Squash and Racketball sanctioned event, meaning National Ranking points are up for grabs. All players are guaranteed at least three competitive matches during the day and the winner will also walk away with a cash prize. Entry price is £10 but if last year’s event was anything to go by, you’ll have to get yours in quick to guarantee your place in this popular tournament! And of course, don’t forget to head back to UK-Racketball for the event report and pictures after the day! Click here for the tournament entry poster. If anyone has any further questions, email Matt Pugh (m06pugh@gmail.com).